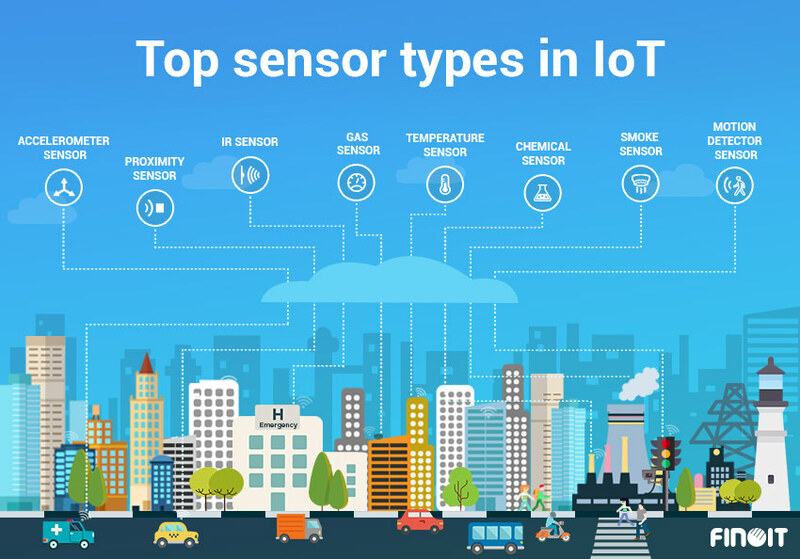 Industries and organizations have been using various kinds of sensors for a long time but the invention of the Internet of Things has taken the evolutions of sensors to a completely different level. IoT platforms function and deliver various kind of intelligence and data using a variety of sensors. They serve to collect data, pushing it and sharing it with a whole network of connected devices. All this collected data makes it possible for devices to autonomously function, and the whole ecosystem is becoming “smarter” every day. By combining a set of sensors and a communication network, devices share information with one another and are improving their effectiveness and functionality. Take Tesla vehicles as an example. All of the sensors on a car record their perception of the surroundings, uploading the information into a massive database. The data is then processed and all the important new pieces of information are sent to all other vehicles. This is an ongoing process, through which a whole fleet of Tesla vehicles is becoming smarter every day. Let’s take a look at some of the key sensors, extensively being used in the IoT world. These sensors have been deployed for a long time in a variety of devices. However, with the emergence of IoT, they have found more room to be present in an even greater number of devices. Only a couple of years ago, their uses mostly included A/C control, refrigerators and similar devices used for environmental control. However, with the advent of the IoT world, they have found their role in manufacturing processes, agriculture and health industry. In the manufacturing process, many machines require specific environment temperature, as well as device temperature. With this kind of measurement, the manufacturing process can always remain optimal. On the other hand, in agriculture, the temperature of soil is crucial for crop growth. This helps with the production of plants, maximizing the output. Thermocouples: These are voltage devices that indicate temperature measuring with a change in voltage. As temperature goes up, the output voltage of the thermocouple rises. Resistor temperature detectors (RTD): The resistance of the device is directly proportional to the temperature, increase in a positive direction when the temperature rises resistance going up. Thermistors: It is a temperature sensitive resistor that changes its physical resistance with the change in temperature. IC (Semiconductor): They are linear devices where the conductivity of the semiconductor increases linearly and it takes advantage of the variable resistance properties of semiconductor materials. It can provide a direct temperature reading in digital form, especially at low temperatures. Infrared sensors: It detects temperature by intercepting a portion of emitted infrared energy of the object or substance, and sensing its intensity, can be used to measure temperature of solids and liquids only, Not possible to use it on gases because of their transparent nature. A device that detects the presence or absence of a nearby object, or properties of that object, and converts it into signal which can be easily read by user or a simple electronic instrument without getting in contact with them. Proximity sensors are largely used in the retail industry, as they can detect motion and the correlation between the customer and product they might be interested in. A user is immediately notified of discounts and special offers of nearby products. Another big and quite an old use-case is vehicles. You are reversing your car and are alrmed about an obstacle while taking reverse, that’s the work of proximity sensor. They are also used for parking availability in places such as malls, stadiums or airports. Inductive Sensors: Inductive proximity sensors are used for non-contact detection to find out the presence of metallic objects using electromagnetic field or a beam of electromagnetic radiation. It can operate at higher speeds than mechanical switches and also seems more reliable because of its robustness. Capacitive Sensors : Capacitive proximity sensors can detect both metallic as well as non-metallic targets. Nearly all other materials are dielectric different from air. It can be used to sense very small objects through a large portion of target. So, generally used in difficult and complicated applications. Photoelectric Sensors : Photoelectric sensor is made up of light-sensitive parts and uses a beam of light to detect the presence or absence of an object. It is an ideal alternative of inductive sensors. And used for long distance sensing or to sense non-metal object. Ultrasonic Sensors: Ultrasonic sensors are also used to detect the presence or to measure the distance of targets similar to radar or sonar. This makes a reliable solution for harsh and demanding conditions. A pressure sensor is a device that senses pressure and converts it into an electric signal. Here, the amount depends upon the level of pressure applied. There are plenty of devices that rely on liquid or other forms of pressure. These sensors make it possible to create IoT systems that monitor systems and devices that are pressure propelled. With any deviation from standard pressure range, the device notifies the system administrator about any problems that should be fixed. Deployment of these sensors is not only very useful in manufacturing, but also in the maintenance of whole water systems and heating systems, as it is easy to detect any fluctuation or drops in pressure. Water quality sensors are used to detect the water quality and Ion monitoring primarily in water distribution systems. Water is practically used everywhere. These sensors play an important role as they monitor the quality of water for different purposes. They are used in a variety of industries. Following is a list of the most common kind of water sensors in use. Chlorine Residual Sensor: It measures chlorine residual (i.e. free chlorine, monochloramine & total chlorine) in water and most widely used as disinfectant because of its efficiency. Total organic carbon Sensor: TOC sensor is used to measure organic element in water. Turbidity Sensor: Turbidity sensors measure suspended solids in water, typically it is used in river and stream gaging, wastewater and effluent measurement. Conductivity Sensor: Conductivity measurements are carried out in industrial processes primarily to obtain information on total ionic concentrations (i.e. dissolved compounds) in water solutions. pH Sensor: It is used to measure the pH level in the dissolved water, which indicates how acidic or basic (alkaline) it is. Oxygen-Reduction Potential Sensor : The ORP measurement provides insights into the level of oxidation/reduction reactions occurring in the solution. Chemical sensors are applied in a number of different industries. Their goal is to indicate changes in liquid or to find out air chemical changes. They play an important role in bigger cities, where it is necessary to track changes and protect the population. Main use cases of chemical sensors can be found in Industrial environmental monitoring and process control, intentionally or accidentally released harmful chemical detection, explosive and radioactive detection, recycling processes on Space Station, pharma industries and laboratory etc. Gas sensors are similar to the chemical ones, but are specifically used to monitor changes of the air quality and detect the presence of various gases. Like chemical sensors, they are used in numerous industries such as manufacturing, agriculture and health and used for air quality monitoring, Detection of toxic or combustible gas, Hazardous gas monitoring in coal mines, Oil & Gas industries, chemical Laboratory research, Manufacturing – paints, plastics, rubber, pharmaceutical & petrochemical etc. A smoke sensor is a device that senses smoke (airborne particulates & gases ) and it’s level. They have been in use for a long period of time. However, with the development of IoT, they are now even more effective, as they are plugged into a system that immediately notifies the user about any problem that occurs in different industries. Smoke sensors are extensively used by manufacturing industry, HVAC, buildings and accommodation infra to detect fire and gas incidences. This serves to protect people working in dangerous environments, as the whole system is much more effective in comparison to the older ones. Smoke sensors detect the presence of Smoke, Gases and Flame surrounding their field. It can be detected either optically or by the physical process or by the use of both the methods. Optical smoke Sensor (Photoelectric) : Optical smoke sensor used the light scatter principle trigger to occupants. Ionization smoke Sensor: Ionization smoke sensor works on the principle of ionization, kind of chemistry to detect molecules causing a trigger alarm. An infrared sensor is a sensor which is used to sense certain characteristics of its surroundings by either emitting or detecting infrared radiation. It is also capable of measuring the heat being emitted by the objects. They are now used in a variety of IoT projects, especially in Healthcare as they make monitoring of blood flow and blood pressure simple. They are even used in a wide array of regular smart devices such as smartwatches and smartphones as well. Other common use includes Home appliances & remote control, Breath analysis, Infrared vision (i.e. visualize heat leaks in electronics, monitor blood flow, art historians to see under layers of paint), wearable electronics, optical communication, non-contact based temperature measurements, Automotive blind-angle detection. Their usage does not end there, they are also a great tool for ensuring high-level security in your home. Also, their application includes environment checks, as they can detect a variety of chemicals and heat leaks. They are going to play an important role in the smart home industry, as they have a wide-range of applications. A sensor which is used to determine the level or amount of fluids, liquids or other substances that flow in an open or closed system is called Level sensor. Like IR sensors, level sensors are present in a wide array of industries. They are primarily known for measuring fuel levels, but they are also used in businesses that work with liquid materials. For example, the recycling industry, as well as the juice and alcohol industry rely on these sensors to measure the number of liquid assets in their possession. Best use cases of level sensor is, Fuel gauging & liquid levels in open or closed containers, Sea level monitoring & Tsunami warning, water reservoirs, Medical equipment, compressors, hydraulic reservoirs, machine tools, Beverage and pharmaceutical processing, High or low-level detection etc. This helps better streamline their businesses, as sensors collect all the important data at all times. With the use of these sensors, any product manager can precisely see how much liquid is ready to be distributed and whether the manufacturing should be stepped up. Continuous level Sensor: Continuous level sensors measure liquid or dry material levels within a specified range and provide outputs which continuously indicate the level. The best example of it is fuel level display in the vehicle. Image sensors are instruments which are used to convert optical images into electronic signals for displaying or storing files electronically. The major use of image sensor is found in digital camera & modules, medical imaging and night vision equipment,thermal imaging devices, radar, sonar, media house, Biometric & IRIS devices. An average consumer would think that this is a regular camera, but even though this is not far from the truth, image sensors are connected with a wide range of different devices, making their functionality much better. One of the best-known uses includes the car industry, in which imagery plays a very important role. With these sensors, the system can recognize signs, obstacles and many other things that a driver would generally notice on the road. They play a very important role in IoT industry, as they directly affect the progress of driverless cars. They are also implemented in improved security systems, where images help capture details about the perpetrator. In the retail industry, these sensors serve to collect data about customers, helping businesses get a better insight into who is actually visiting their store, race, gender, age are only some of the useful parameters that retail owners get by using these IoT sensors. Motion detection plays an important role in the security industry. Businesses utilize these sensors in areas where no movement should be detected at all times, and it is easy to notice anybody’s presence with these sensors installed. These are primarily used for intrusion detection systems, Automatics door control, Boom Barrier, Smart Camera (i.e motion based capture/video recording),Toll plaza, Automatic parking systems, Automated sinks/toilet flusher,Hand dryers,energy management systems(i.e. Automated lighting, AC, Fan, Appliances control) etc. On the other hand, these sensors can also decipher different types of movements, making them useful in some industries where a customer can communicate with the system by waving a hand or by performing a similar action. For example, someone can wave to a sensor in the retail store to request assistance with making the right purchase decision. Even though their primary use is correlated with the security industry, as the technology advances, the number of possible applications of these sensors is only going to grow. Passive Infrared (PIR) : It Detects body heat (infrared energy) and the most widely used motion sensor in home security systems. Ultrasonic : Sends out pulses of ultrasonic waves and measures the reflection off a moving object By tracking the speed of sound waves. Microwave : Sends out radio wave pulses and measures the reflection off a moving object. They cover a larger area than infrared & ultrasonic sensors, but they are vulnerable to electrical interference and more expensive. These sensors are now present in millions of devices, such as smartphones. Their uses involve detection of vibrations, tilting and acceleration in general. This is great for monitoring your driving fleet, or using a smart pedometer. In some instances, it is used as a form of anti-theft protection, as the sensor can send an alert through the system if an object that should remain stationary is moved. They are widely used in cellular & media devices, vibration measurement, Automotive control and detection, free fall detection, aircraft and aviation industries, movement detection, sports academy/athletes behavior monitoring, consumer electronics, industrial & construction sites etc. Hall-effect accelerometers : Hall-effect accelerometers are using Hall principle to measure the acceleration, it measures the voltage variations caused by changes in a magnetic field around them. Capacitive accelerometers : Capacitive accelerometers sensing output voltage dependents on the distance between two planar surfaces. Capacitive accelerometers are also less prone to noise and variation with temperature. Piezoelectric accelerometers: Piezoelectric sensing principle is working on the piezoelectric effect. Piezo-film based accelerometers are best used to measure vibration, shock, and pressure. Each accelerometer sensing technology has its own advantages and compromises. Before selecting, it’s important to understand the basic differences of the various types and the test requirements. A sensor or device which is used to measure the angular rate or angular velocity is known as Gyro sensors, Angular velocity is simply defined as a measurement of speed of rotation around an axis. It is a device used primarily for navigation and measurement of angular and rotational velocity in 3-axis directions. The most important application is monitoring the orientation of an object. Their main applications are in Car navigation systems, Game controllers,Cellular & camera devices, consumer electronics, Robotics control, Drone & RC control helicopter or UAV control, Vehicle control/ADAS and many more. There are several different kinds of gyro sensors which are selected by their working mechanism, output type, power, sensing range and environmental conditions. These sensors are always combined with accelerometers. The use of these two sensors simply provides more feedback to the system. WIth gyroscopic sensors installed, many devices can help athletes improve the efficiency of their movements, as they gain access to the athletes movement during sports activities. This is only one example of its application, however, as the role of this sensor is to detect rotation or twist, its application is crucial for the automation of some manufacturing processes. A sensor which measures the physical quantity of light rays and convert it into electrical signal which can be easily readable by user or an electronic instrument/device is called optical sensor. Optical sensors are loved by IoT experts, as they are practical for measuring different things simultaneously. The technology behind this sensor allows it to monitor electromagnetic energy, which includes, electricity, light and so on. Their main use can be found in Ambient light detection, digital optical switches, optical fibres communications,due to Electrical isolation best suited for oil and gas applications, civil and transportation fields, High speed network systems, elevator door control, assembly line part counters and safety systems. Fiber Optics : Fibers optics carry no current, So its immune to electrical & electromagnetics interference and even in damaged condition no sparking or shock hazard happens. Pyrometer : It estimates the temperature of an object by sensing the color of the light and Objects radiate light according to their temperature and produce same colors at same temperature. Proximity & Infrared : Proximity use light to sense objects nearby and Infrared are used where visible light would be inconvenient. It is clear that IoT has become incredibly popular, and current trends show that it is the future. It simply helps with automation of various processes, making these systems quite useful for both regular consumers and businesses. We are yet to see the full potential this technology carries, as the whole platform is becoming smarter through the fusion of all the abovementioned sensors. When you consider the fact that all of the measured data is collected and can be analyzed, it is obvious that IoT is going to become even smarter in the future.